Al Zayani along with Ariston Thermo officials at the plant opening. 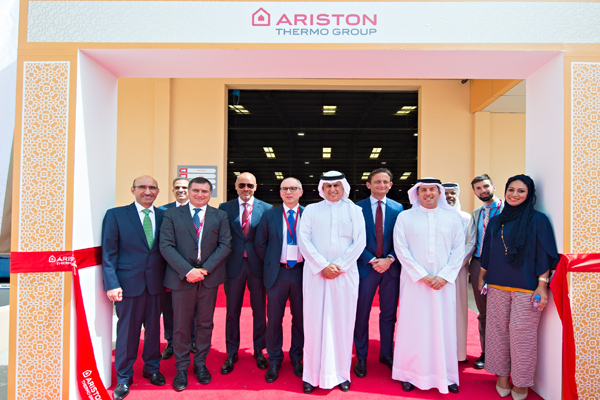 Italian water heat maker Ariston Thermo opened its first manufacturing plant in Bahrain, today, marking its first industrial operation in the Middle East and North Africa (Mena) region. The 7,000-sq-m plant located in the Bahrain International Investment Park (BIIP) in Hidd was inaugurated by Industry, Commerce and Tourism Minister Zayed Alzayani today (May 7) in the presence of Italian ambassador Domenico Bellato and Ariston Thermo Rapid Development Countries and Americas Director Dr Carlo Andreatini. The new plant with a production capacity of up to 250,000 electric water heaters will manufacture storage electric water heaters branded Ariston, which will be mainly marketed in the Mena region, Andreatini revealed. A leading company in the water heating and heating industry, Ariston Thermo group has 26 production sites in 15 countries in addition to 65 operating companies and 5 representative offices in 38 countries. The company had been looking for a location for its production site in the region since 2010 but finally zeroed in on Bahrain’s BIIP, stated Andreatini. Speaking at the launch, Alzayani said: "The selection of BIIP for Ariston’s first manufacturing facility in the region demonstrates the quality of the location and the competitive advantages which Bahrain has to offer to global companies." Alzayani pointed out that project was an important one for Bahrain as it met several key objectives, enabling the growth and diversification of Bahrain’s economy, as well as creating quality skilled jobs for Bahrainis in the fields of engineering and business. The plant currently employs about 50 people. "The Ministry and Ariston are partners for the long-haul and the Ministry will do everything in its capacity to provide the right support to facilitate the company's success," he added. Zayani said that 60 per cent of the workforce was Bahraini nationals at the plant. Stressing on the importance of Ariston being the first Italian manufacturing plant in Bahrain, Al Zayani said: "We have gone for the global a leader in the sector. By attracting one of the biggest names in manufacturing we hope it will act as a catalyst and attract more investment in Bahrain." "In the initial phase, they will test Bahrain and we are confident that they will value the kingdom and expand further with millions of dollars of investment," stated the minister. “We welcome the economic trade links which take place between the two countries and hope this investment will attract many more Italian companies to Bahrain and to BIIP, more specifically,” said Alzayani. The minister said Bahrain was home to more than 180 Italian commercial enterprises and ``we hope to increase that number, each year,” he said. In the initial phase, Ariston will manufacture about 100,000 units and will gradually ramp up its production based on the market response. The company will however, continue to import its large commercial water heaters through its trading partners. On picking Bahrain for its inaugural plant in the region, Andreatini said: "Bahrain gives us quick access to the Mena region in addition to being fantastically located, open and very business friendly." "Besides the kingdom has extremely good commercial relations with all the countries in the region. Also it has been extremely supportive and friendly," he added. “Keeping production close to the most important markets is indeed a key pillar of our group’s growth strategy that allows us to better and promptly respond to the specific needs of our customers,” stated Andreatini. With the new production site in Bahrain, the company hopes to boost its presence in the region, where it claims the Ariston brand is already leading the water heating category for many years.